by The Longest Way Home ~ November 7th, 2011. Published in: Travel blog » How to guides ... » Sabah (Malaysian Borneo). So wrote the author of the torn out pages of my guide-book. I think what they meant to say was that “Borneo” was the only place to see such a long-nosed sexually hyper active primate, I believe there are some in Sarawak too. But this is where I’ve spent a lot of time in Sandakan, so let’s see. To get to Labuk Bay is impossible without private transport, or at least staying out there is. This was the second thing I read in my guide-book. Let me tell you now, you can. I picked up the phone and called the Labuk Bay sanctuary. Sure enough the mini bus appeared before the prearranged time. Omar got out and welcomed me with lots of apologies. Apparently he’d been there a while, but thought I was a guest of the Sandakan hotel. The journey took about an hour and Omar had given me the seat behind him. He was nice chap, and kept pointing out various bits of wildlife as we drove on by. At a small entrance gate we had to buy the 50 ringgit entrance ticket, plus 10 for a camera before heading off to the first of 4 feeding platforms. I really would wish tourist places would stop with this extra charge for cameras. Tt looks stupid on your part. Today, phones have 10MP+ cameras, HD video etc. Just be done with it, up the price, and drop the extras. Well in terms of a wow, large primate factor, no. But in terms of how it’s run on a daily basis, friendly, knowledgeable staff etc, yes. More on this later in the week. Much like the Orangutans in Sepilok the Proboscis Monkeys were a good 30 feet back from the small crowd of tourists. The alpha male was just about distinguishable with his bright triangle stripped back, elongated rubbery nose and what seemed like a permanent erection. First feeding over, back into the mini van and we were all shuttled off to the next feeding platform. Down a dirt road, twisting and turning we were there within 10 minutes. 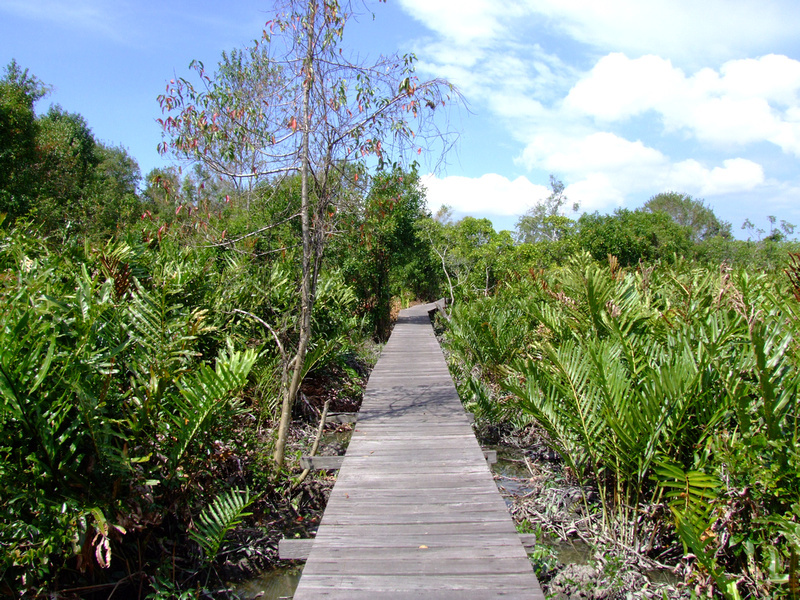 A long wooden walkway meandered over a swampy mangrove area. This alone was longer and slightly more interesting than Sepilok’s offering. Moreover, everything was administered a lot better. A huge open area wooden platform was our new area to view the feeding. This time the Proboscis Monkey’s put on a show. The Alpha male was having one of his wives courted away by an up and coming male contender. A very similar plot to what the main bus video we had been shown earlier described. Omar confirmed the soap opera drama. “They eat, and have much play time,” Omar said pointing to the Alpha male just as he began some procreation with one of his wives. The Alpha Male seemed more interested in showing off his recreational abilities to others than to his wife. Not that I watch a lot of animals mate. But, I have had glimpses from the discovery channel. The alpha male might also have watched the odd x-rated movie it seemed. Is there a reason why you didn’t take a photo of them mating? I have some, but didn’t think it was appropriate to post. Some things are best left to the imagination! Adorable and strange! 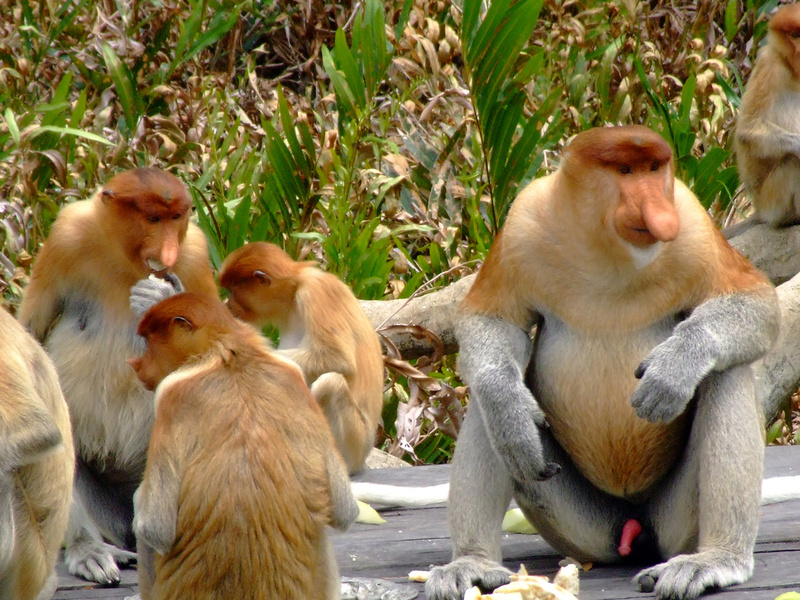 If you’re on a tight schedule, can you still see both Orangutans and Proboscis Monkeys on the same day? That would be tough unless you did one of the tours, or had your own transport as there is quiet a bit of distance between the two centers. 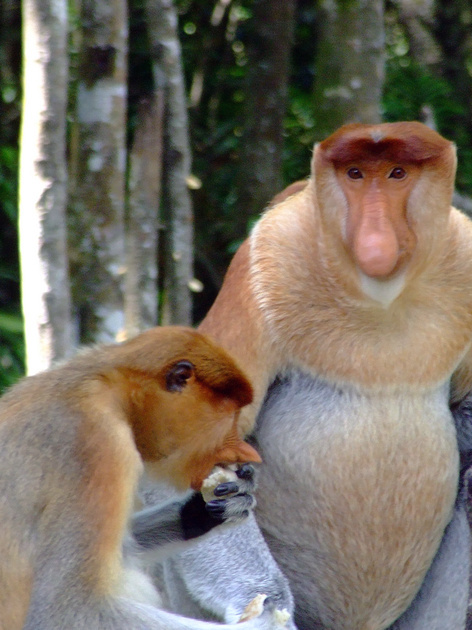 I just found out that the Proboscis Monkey is meant to have a higher population than both Sarawak and Sabah in Kalimantan, Indonesia. I’ve never seen something like this. So unusual. Any idea why they have noses like that? Well, according to one website, it’s to attract ladies! I knew exactly where you were heading with your teaser in your previous post. I also enjoyed my time at the Proboscis sanctuary, a bit more than that of the Sepilok Orangutan reserve. I suppose it could have been due to getting their late in the afternoon with no one else around as we were driving out own vehicle. I didn’t get quite the show you seem to have got though, but the big fella was ever present all the same. It’s worth the effort of getting out to see this place, I do recommend it to anyone traveling in the region. This may seem an odd question but you didn’t happen to run into a crazy pet otter that lives at the site by any chance ??? Ha ha, well there’s another one coming up later in the week. It’s interesting to note that many people seem to like Labuk Bay over Sepilok! And, I don’t think it has anything to do with Orangutans vs Proboscis monkeys. Just simply to do with how the places are run. I’m writing something up about that as we speak. No crazy pet otters that I could see. Rumors of a bad tempered crocodile have plagued the area lately. But I’ve not seen one. Nice pictures and very inspiring. I have heard of this place before, but didn’t know these species existed there. I think even rainforests are a great place to explore in Malaysia and the government seems to give lot of consideration in preserving these old species. Thank you. The Labuk Bay is actually a privately run sanctuary. No government funding. It’s an interesting place due to this as well. I’ll be doing a comparison next week! Very interesting … Are there wild species that actually live in freedom without the help of humans where you are? The lines are crossing Ivy. It’s getting harder to tell. Many Orangutan live on land that’s been bought for them. They live wild. But an increasing number of “private” tours and the live are encroaching deeper into the forests to see them. Likewise there are many smaller animals that have adapted around humankind. And pop up in the towns etc. It’s hard to answer. The reality is yes, but I don’t know for how much longer. reading about your visit, i am keen to go too. i tried a few times to get in touch via email. but they do not respond. how did you get in touch with them. can you share the contact details. would be great.